To suit doors 10kg max. The Frelan Hardware 75mm Double Action Spring Hinge Polished Brass is a double action hinge - it will allow the door to open in either direction and will return the door to the closed position. Spring hinges have gained popularity in dwellings which require self-closing fire doors such as flats and multiple storey town houses. 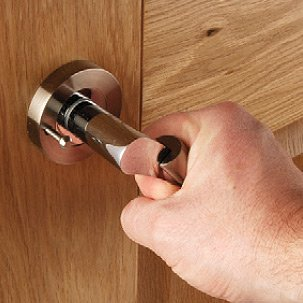 The hinge is to suit doors 20-25mm thick, 650mm wide and with a maximum weight of 10kg. PLEASE NOTE - these hinges are not supplied with screws as part of the standard packaging, please order screws separately. Each pair of hinges comes with tensioning pins, which are inserted into the knuckle of the hinge, once fitted, to tension the internal spring mechanism. The spring tension and closing force is controlled by the location of the pin into pre-determined holes around the hinge knuckle. It is also available in a silver enamelled finish. Some of these variations can be found in the related products. Although these double action spring hinges will close the door, they are not approved for use on fire door openings. If you require a double action spring hinge for a Fire Door situation please see the 200mm option. As of 6th April 2007, it is no longer a building regulations requirement that a self closing device, such as a perco or spring hinges, be fitted to internal fire doors in dwellings. It has become the responsibility of the occupants to ensure that fire doors are closed at night. Closing devices are still required on flat entrance doors and garage doors leading into a dwelling. However, these closers now have to comply with BSEN 1154, which currently means they need to be overhead door closers. If in any doubt, please discuss the matter with your Building Control Officer before commencing any work.